PRIVATE COMMISSION INFORMATION for M. Labelle/ aka "Keewakw"/ "Battlehog"
*Base prices only. Prices subject to change depending on project complexity, special offers, etc. Please contact me directly for other types of commissions such as graphite, full color pencils, full color watercolor, etc. I accept credit cards and transfers through Paypal only at this time. If you are within Canada an instant bank-transfer may be acceptable. Because of the international exchange rate and trouble with processing I cannot accept cash, checks or money orders. I do not accept payment without confirmation. I will INVOICE you at the address provided when the final price has been confirmed. Do not send payment without first receiving an invoice. Please do not try to bargain or convince me to lower prices. Unless I am hosting a sale or it is a special event , the prices I quote to you may be higher than the base listed, but they will still be FAR below the industry standards. If you can’t afford my work I understand - and you are free to go elsewhere. I , the artist, retain the right to cancel a commission at any time, for any reason. In this case, refunds and/or or partial WIPs will be awarded as outlined below. The client has the right to cancel a commission at any time - Refunds and/or partial work will be given to the customer as appropriate via the outline below or at the artist’s discretion. The commission is cancelled before it is begun. At the artist's discretion or in the event of an emergency / personal tragedy. The commission is cancelled during first sketch approval stage (if applicable). The commission is cancelled AFTER the first sketch approval stage. The commission is cancelled due to rude behaviour or continual harassment of the artist. You may contact me at any time via e-mail or private message to check up on the progress of your commission and I should reply within 24-48 hours. Please note, however that constant pressure or contacting me in multiple places at once may be construed as harassment. 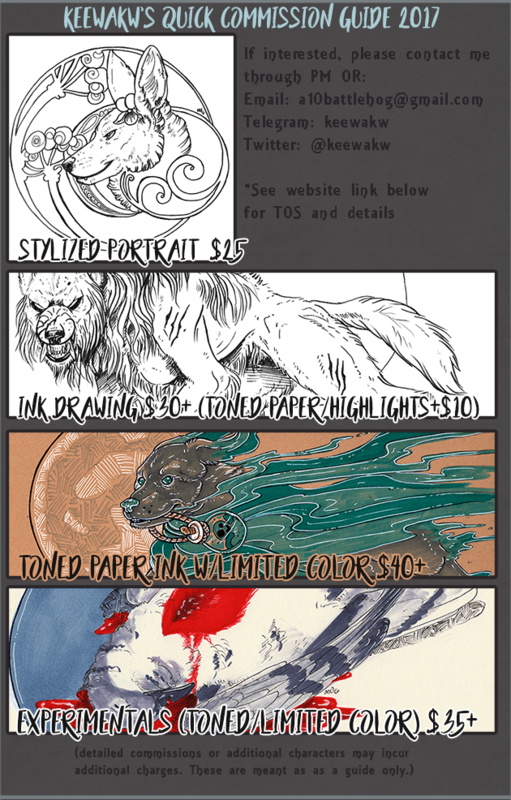 Previews for sketch commissions (white or toned paper) are not available unless previously discussed. All commissions valued at over $25 are eligible for one sketch preview, where the general layout and character placement/accuracy will be reviewed by the client. Any feedback on mistakes, missing limbs/piercings, or other opinions should be discussed at this time. For commissions valuing over $60 a secondary revision will be provided free of charge. Additional previews , if required, can be purchased at $5 a piece. In the event of the final product having major mistakes (wrong colors, markings, jewelry, missing parts, etc) these will be fixed once free of charge if brought to the attention of the artist within 14 days after being received. Between 15-30 days, post-edits will cost a base price of $5. Post-edits are not available on pieces more than 30 days after completion. You MAY repost, share, or re-upload your commissioned work anywhere on the web with credit to me and without the signature/link removed. You MAY make prints or products (playmats, mousepads, t-shirts etc) of commissioned work for your own personal use ONLY. If you want the commercial rights to the work, please contact me about purchasing the rights. You MAY NOT claim the work as your own, submit it to product websites (such as Redbubble/Society6, etc) or benefit commercially from it in any way. I, the artist, retain all commercial rights to the work and may use it in portfolios or for personal advertisements / products unless a formal agreement has been made beforehand. I try to keep my queue relatively small, but I will always be willing to give you an idea of my progress and how many people are “in line” ahead of you. I, the artist, promise to do the best work possible within a reasonable amount of time. However, life gets in the way and I cannot guarantee a specific completion date for any commission. If you have a specific deadline in mind, please mention it when submitting your initial inquiry and I will let you know if it is possible. To be fair, I do not accept “rush” commissions if I have a nearly-full queue.